Home » Blog » Meet Rebecca, our Interim CEO! Meet Rebecca, our Interim CEO! With the new year comes exciting changes here at the Community Cycling Center. We are lucky to have Rebecca Channer join us as Interim CEO. In order to get to know her a bit better, we asked her to tell us about herself! 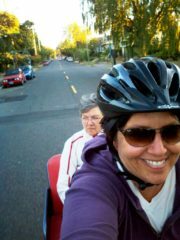 Why did you choose to join the Community Cycling center as its Interim CEO? I have been a resident of N/NE Portland for most of my 20 years living in Oregon, and I have dedicated my career to supporting nonprofit organizations that make a very meaningful difference in our communities and also embody values that resonate with me personally. As a neighbor, customer and contributor, I have had the pleasure of watching the Cycling Center grow and develop over a long period of time, including the development of the Bike Repair Hub in New Columbia, which is just up the street from where I live now. I also love all things related to bikes, especially riding them. What can this community expect from you over the course of your time with us? Leadership, collaboration, commitment, transparency, steadiness, compassion and humor. Let’s have some fun together! Strange but true, I like to ride from my home in Portsmouth along the Columbia River to Blue Lake and back. Water, sky, boats, planes, bridges, bikes, trains–all modes of transport, movement and beauty converge on that route, and it makes me feel very awake and alive. If you had to choose a personal motto, what would it be? What is one dream you have for this region? So many of our local nonprofit organizations and foundations are working on issues related to diversity, equity and inclusion, which is fantastic, but I am eager to see a greater ethos of sensitivity, kindness and justice evolve across all sectors of our communities. These values are not merely concepts or “buzz” words in my mind; they are in fact the roots of opportunity for meaningful connection and lasting change. I am excited about the possibility of living in a richly diverse and genuinely welcoming city, but we have some real work to do.